Heavy-duty hydraulic clutch slave and master cylinder assembly by South Bend Clutch for '03-'18 Dodge Turbo Diesel trucks. 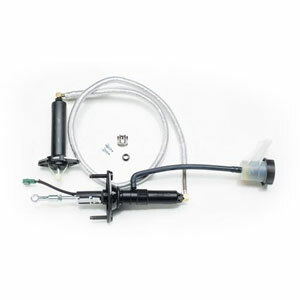 The heavy-duty hydraulic assembly comes completely assembled with no bleeding required for installation. NOTE: Will not work on '05-'18 Ram Cummins trucks equipped with the G56 OEM dual mass flywheel clutch. Noticed a positive difference the first time I step on the clutch pedal after installing the South Bend Slave Cylinder. Now, shifting into gear is a lot more smoother. Geno's Garage has great prices and professionally made parts. No more go to the local parts houses to get cheaply made parts sold people with little or no knowledge of the part being sold. I have been using South Bend Hydraulic clutch master & slave units whenever one of my trucks approaches 100K miles. That's about how long the OEM units are good for, sometimes less. Easy to install and bulletproof!